Soap making involves a chemical process known as saponification in which fats are combined with a caustic chemical such as sodium hydroxide, or lye. The process is fairly simple to do at home; however, use caution when working with lye. The olive oil in this recipe is a liquid, while the coconut and palm oils are solid at room temperature. Measure all your ingredients carefully, and follow the precise order of addition. The recipe makes just over 4 lbs of soap. Grease soap molds lightly with vegetable oil. Purchase soap molds from a soap-making supply store, or create your own from recycled plastic bottles or cups. Wearing rubber gloves and safety glasses, weigh water and pour into the glass measuring cup. Weigh lye and slowly add to the water. Stir with a wooden spoon until dissolved. Avoid touching the sides of the container, as the mixture will get quite hot from the chemical reaction. Cool the mixture to approximately 110 degrees F, measured with a candy thermometer. Weigh olive oil, coconut oil and palm oil into the stainless steel pot. Heat oils over low heat on the stove top, and stir gently with the second wooden spoon until melted. Turn off the heat and remove the pot from the stove top. Cool oils to approximately 110 degrees F, measured with the second candy thermometer. Slowly add the cooled lye mixture to the cooled oil mixture until combined. Stir rapidly, without splashing, until the mixture traces. Tracing occurs when the mixture thickens to the consistency of soft pudding and your spoon leaves visible stirring patterns in the soap mixture. Pour the traced soap mixture into the prepared molds. Place the filled molds in a cool area where they will not be disturbed. After 24 hours, gently remove the soaps from the molds. Allow your soaps to rest undisturbed for four weeks. This time is necessary for your soaps to cure and complete the saponification process. Cool the lye mixture and the oil mixture to within 5 degrees of each other before mixing the two together. 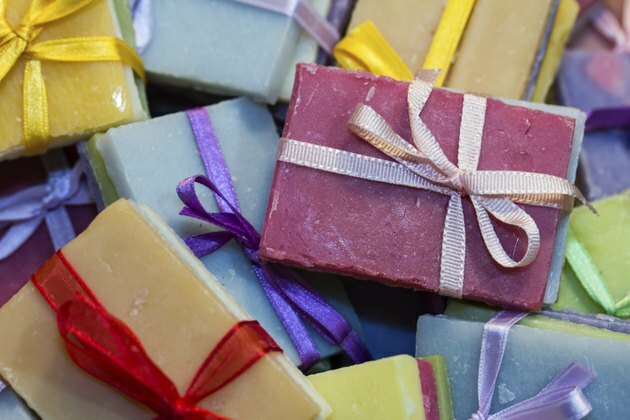 Allow enough time for your soaps to cure, otherwise they will be mushy and will not lather well. Add fragrance to your soap by stirring 2 tbsp. of your favorite essential oil into the soap mixture after it traces and before you fill the molds. Lye is a caustic chemical that causes severe burns. Avoid contact with your skin, and work in a well-ventilated area to avoid breathing the fumes. Always add lye to the water and not the other way around.